Rate this project Aaron Griffin has announced the release of Arch Linux 2009.02, an independently developed community distribution, based on a rolling-release package model and targeted at competent GNU/Linux users: "We proudly announce the release of the new Arch Linux installation images, version 2009.02. It took us quite a while, but we think the result is worth it - we added some cool new things and ironed out some long-lasting imperfections. 2009.02 comes with the following features: Linux kernel 2.6.28; ext4 support, installation can be done on a ext4 root partition; rescue and maintenance capabilities for ext4 root partitions; fallback ISOs with the ISOLINUX bootloader, for those that have trouble booting GRUB-based images; several bug fixes in the installer; brought the included documentation up to date; inclusion of AIF (Arch Linux Installation Framework), the next generation installer, currently under development." Here is the full release announcement. Download (MD5): archlinux-2009.02-core-i686.iso (311MB), archlinux-2009.02-core-x86_64.iso (326MB). Arch Linux 2008.06 has been released. Arch Linux is an independently developed i686/x86_64-optimized community distribution, based on a rolling-release package model and targeted at competent GNU/Linux users. From the announcement: "Arch Linux 2008.06 'Overlord'. The Arch Linux 2008.06 ISO images are out. This release introduces many changes: 'base' category is always installed; use of UUIDs for persistent device naming; availability of USB disk images alongside traditional ISOs; true live Arch installation environment; inclusion of the beginner's guide from the Wiki; documentation updates; includes the current stable kernel, 2.6.25.6." Here is the very brief release announcement. Download the core installation ISO images from here: archlinux-2008.06-core-i686.iso (291MB, MD5, torrent), archlinux-2008.06-core-x86_64.iso (305MB, MD5, torrent). A release candidate for Arch Linux 2008.04 is out and ready for testing: "A new batch of install images is currently being uploaded to mirrors. The FTP images have been made available tonight, while the CORE images will be pushed tomorrow night in order to distribute the load. This marks the first release based on a true live Arch system. That is, what's on the images is just a plain old base installation which just happens to boot from a CD or a USB stick. The installer script itself is roughly the same as it has always been. The most noticeable change is the use of UUIDs instead of sdX/hdX entries by default.If you get the chance, please give the images a spin. By the way, the 'RC' status of these images should not be a turn-off if you're looking to install Arch; there's a very good chance they'll work just fine for you." Here is the brief release announcement. Download (MD5): arch-core-install-2008.04-rc-i686.iso (287MB), arch-core-install-2008.04-rc-x86_64.iso (303MB). Tobias Powalowski has announced the release of Arch Linux 2007.08-2: "Arch Linux 2007.08-2 'Don't Panic' has been released. This is the first release to use our new repository layout. There are two ISOs - FTP and Core. Changelog: kernel 2.6.22.9 usage; disabled arch_addons hook by default, it is now triggered by arch-addons boot parameter; fixed the nasty /dev mount bug; fixed the /dev/ttyS0 errors if no serial port is installed in the system; fixed repositories in install environment to fit to both architectures; fixed km to not show broken characters after exit; fixed GRUB installation with XFS file system; fixed package clearing if setup option was chosen; added PPTP client to install environment; added sdparm to install environment; added all free wireless drivers to install environment...." Read the rest of the release announcement for a complete list of changes. Download: Archlinux-i686-2007.08-2.core.iso (158MB, MD5), Archlinux-x86_64-2007.08-2.core.iso (166MB, MD5). Tobias Powalowski has announced the release of Arch Linux 2007.08: "It's done, final 2007.08 'Don't Panic ISOs' for i686 and x86_64 are ready. It's mostly a 2.6.22.x ISO with some fixes to last Linuxtag ISOs. Changelog to last Duke-Linuxtag2007 installation ISO: kernel 2.6.22.1 usage; update mkinitcpio for new 2.6.22 firewire layout; update hwdetect for new rtc_sys and firewire stuff; memory requirements bumped to 128MB; serial console support in install environment; USB Keyboard issues fixed; fixed quotation marks around CONSOLEFONT and CONSOLEMAP; fixed DHCP rc.conf entry; fixed not generating glibc locales. I would like to thank you all, who assisted in testing and of course finding/fixing bugs. Happy installing and have fun." Here is the brief release announcement. Download: Archlinux-i686-2007.08...current.iso (517MB, MD5), Archlinux-x86_64-2007.08...current.iso (498MB, MD5). Tobias Powalowski has announced the release of Arch Linux 2007-05, the first official release since the project implemented a new, more frequent release policy: "It's done, final 2007.05 'Duke' ISO images for i686 and x86_64 are ready. Changelog to the last installation ISO image: Pacman 3; kernel 2.6.21.1. Setup changes: sound cards are now also ordered by hwdetect; rsync has been added to the installation environment; proxy support during FTP installation; selection to copy installation network setup to final installed system; selection about keeping package cache during CD/FTP installation...." Here is the brief release announcement. Download: Archlinux-i686-2007.05-Duke.current.iso (559MB, MD5), Archlinux-x86_64-2007.05-Duke.current.iso (529MB, MD5). Tobias Powalowski has announced the release of Arch Linux 0.8: "It's done - final 0.8 Voodoo ISOs for i686 and x86_64 are ready. Changelog: dropped install floppy support; switched from BusyBox to Archboot usage; updated packages (including Linux 2.6.20.4); installation on PATA and IDE possible (PATA is default now); USB devices should now work; usage of hwdetect and udev auto-detection during boot; added Memtest86+ to ISO; Pacman is included to allow installation of any other needed package in install environment; added Arch network support, including SSH, Telnet and Portmap services; added VPN support; added GRUB and LILO to install environment...." Read the release announcement for further details. Download: Archlinux-i686-0.8-Voodoo.current.iso (561MB, MD5), Archlinux-x86_64-0.8-Voodoo.current.iso (531MB, MD5). Tobias Powalowski has announced the second beta release of Arch Linux 0.8: "After one month of heavy hacking on archboot, 0.8 beta 2 ISOs are available for i686 and x86_64. Here are the highlights: switched to kernel 2.6.20.1; Pacman is included to allow installation of any other needed packages in install environment; complete /etc/rc.d/ and /etc/rc.conf support; complete Arch network support, including SSH, Telnet and Portmap services; custom configuration files support; loading packages as add-ons during boot; links and Naim included to be able to communicate over the Internet; complete kexec support...." More details in the release announcement. Download: current-0.8-beta2-20070222-i686.iso (541MB, MD5), current-0.8-beta2-20070223-x86_64.iso (504MB, MD5). The first alpha release of Arch Linux 0.8 is ready for download and testing: "Hi Arch community, I'm sure you all saw the bump to 0.8 'Voodoo' yesterday; new release also means new installation ISOs. Short summary what happened and what still needs to be done: full mkinitcpio support; updated packages (including Linux 2.6.19.1); installation on PATA and IDE possible (PATA is default now); ide-legacy option included for old IDE subsystem; dropped install floppy support; switched from BusyBox to archboot usage; USB devices (keyboards, CD, DVD) should now work; usage of hwdetect and udev auto-detection during boot; added Memtest86+ to ISO; added installation support on CCISS devices..." Read the full release announcement for further information. Download: current-0.8-20061218-i686.iso (546MB, MD5), current-0.8-20061219-x86_64.iso (529MB, MD5). Judd Vinet has announced the release of Arch Linux 0.7.2, a minor update to the Arch 0.7 series: "Arch Linux 0.7.2 (Gimmick) is now available for download. This time, we've provided three different ISO images for you to use: an FTP-only image (13MB), a Base-only image (145MB), and our full image that contains the entire Current repository (519MB)." Gimmick is the first official release to have the new modular X.Org 7.0 and GNOME 2.14, as well as KDE 3.5 available in a "stable" repository. Among other upgrades, it also includes the Linux kernel 2.6.16.16. Here is the brief release announcement. Download: arch-0.7.2.iso (518MB, MD5); also available via BitTorrent. A brand new version of Arch Linux has been released: "Here it is, folks. All the Arch goodness you know and love, only half the fat. We've added some better hardware detection, stock initrd support for neat things like encrypted root filesystems, network profiles, and more little goodies here and there. Thanks for the patience, everyone. As always, read the docs before installing." See the brief release announcement on the distribution's news page. Download: arch-0.7.1.iso (509MB, MD5); also available via BitTorrent. Arch Linux is an independent i686-optimised community distribution for intermediate and advanced Linux users. A pre-release ISO image of the upcoming Arch Linux 0.7.1 has been released for testing: "There is a 0.7.1-pre1 ISO up on the servers now. This is the first Arch Linux ISO that's completely devfs-free. The installation environment uses a static dev, and all references to devfs-style device names have been removed from the setup script. Otherwise, the installation process is the same as 0.7. One notable addition to 0.7.1 is the ability to install Arch on to an encrypted root filesystem. If you're testing 0.7.1 out anyway and you want to try it, I've started a little howto." See the release announcement for further details. Download: arch-0.7.1-pre1.iso (529MB, MD5); also available via BitTorrent. OSNews has published a long interview with the core developer team of Arch Linux, including its founder Judd Vinet: "OSNews: How would you compare Arch to Slackware, Debian, Gentoo and even FreeBSD? Judd Vinet: Tough to compare really, they're all great distros. I find it flattering to have Arch compared to the likes of Slackware and Debian, as I've always revered them as the time-tested, rock-solid distributions on which other distros are based. Arch has been largely successful in adopting positive traits of other distributions, and you're quite accurate in picking those four. I think Arch has borrowed some good qualities from each of those systems, especially Slackware and FreeBSD." The 9-page interview starts here. 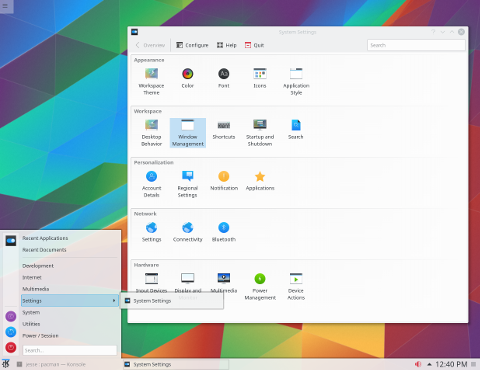 LinuxTimes has published a comprehensive review of Arch Linux with many screenshots: "By writing their own package manager and having their own packages (i686 optimized), Arch has really set itself apart. This, combined with their KISS (Keep it Simple Silly) philosophy, makes Arch a good distribution to consider. One thing to note is that Arch is still at 0.7, which means that all the bugs have not been ironed out from it. I got a few weird errors with GNOME in Arch. I also ran into one or two minor problems with pacman. Overall, there are no big show stopping bugs that would prevent me from recommending Arch wholeheartedly to you. Also, from what I have seen of it, the Arch community seems very welcoming and sensible." The 4-page review starts here. OSNews has published a 5-page review of Arch Linux: "Arch Linux quotes itself as being 'an i686-optimized Linux distribution targeted at competent Linux users.' Part of its philosophy is that by not providing you with lots of configuration utilities, you are forced to 'learn the ropes' and you will benefit from the additional knowledge acquired. A sensible approach you may think, and is fine for experienced and/or fearless techies. You know that this isn't going to be the distro to recommend to your mother! But, I wouldn't say Arch Linux is elitist as some readers may fear." The full review. Arch Linux 0.7, code name "Wombat", has been released: "Well, the release that never comes has finally arrived. Arch Linux 0.7 is now available in ISO form, ready for public consumption. You can find fresh torrents and many-a-mirror on our download page. Install docs are here. Many thanks to all the users and developers who toil on this project day in and day out. I think we should be proud." Here is the full release announcement. Download: arch-0.7-base.iso (210MB), arch-0.7.iso (560MB); also available via BitTorrent. For your information, the "base" ISO only contains the kernel and essential packages, while the full ISO image includes a complete Arch system with X.Org and the IceWM graphical desktop. Additional applications are available for installation with the "pacman" package manager. A new issue of Arch Linux Newsletter is out, covering the availability of KDE 3.3.2 for Arch Linux, and other interesting topics: "KDE 3.3.2 in testing. The new KDE version is now in testing - they are pre-packages but if nothing changes they will be the final ones. Please test them and report errors in this forum thread. Changes since 3.3.1 can be found here. Changes from my side: kdebindings now compile again with Java support; added qscintilla to kdebindings; the startkde script has been changed again - please the guys with tcsh problems test it; added pkg-config to kde.sh; modified arch splash screen a little bit; cleaned up and added depends." The latest Arch Linux Newsletter is available here. The developers of Arch Linux, an increasingly popular binary-source hybrid distribution optimised for the i686 architecture, have announced the release of a second beta of the upcoming version 0.7: "There's a beta2 ISO up on the servers now, new and improved with a 2.6.9 kernel and a couple of small fixes. If nothing explodes, the beta2 ISO will likely graduate to 0.7-final." The release announcement can be found on the distribution's news page. Only the small-size "base" ISOs are built during the beta testing period; get the latest one from one of the many mirror sites or download from here: arch-0.7-beta2-base.iso (200MB). Bugs should be reported in the Bug Tracker. The developers of Arch Linux have announced the availability of a new beta ISO of the upcoming Arch Linux 0.7, code name "Wombat": "0.7-beta1 ISO released. The 0.7-beta1 (base only) is now available on the master FTP site, and soon on the mirrors. If you're looking to install Arch or just have time to kill, please help us test it out. Bugs can be thrown at the bug tracker." Read the announcement here. Download: arch-0.7-beta1-base.iso (197MB). Arch Linux is an increasingly popular binary/source hybrid distribution for i686 processors. Arch Linux 0.6 is out: "Arch Linux 0.6 (Widget) is released! We've made a lot of improvements over the last seven months, and hope you enjoy our efforts. We've seen a surge of activity in the Arch community, and it's resulted in more documentation, a huge increase in packages, and tons of useful information in our forums. Keep it up everyone, Arch Linux is slowly becoming the mature distribution we want it to be. A big thank-you to everyone that has donated to help support our server costs. Seriously, we rely on your contributions and you haven't let us down. Changelog, documentation, and download mirrors are at their usual locations." The announcement. Get either the base ISO image: arch-0.6-base.iso (171MB) or the complete ISO image: arch-0.6.iso (493MB). Arch Linux is optimised for the i686 architecture. 2004-02-10 Arch Linux: An End To My Distro Shuffle? OSNews is highly impressed with Arch Linux: "Arch Linux is a great distro for the expert user who want a customized Linux installation without the hassle of hunting for packages and dependencies. Let's face it, the fun of Linux is tweaking and customizing not configure; make; make install. It's an extremely well done distribution that just plain works. In the week or so that I've been running it exclusively, I haven't run across any negatives." The full review with screenshots. Arch Linux 0.5 has been released: "Arch Linux 0.5 (Nova) is now available for download. Over the last seven months we've added a million package updates, PAM support, LVM support, GRUB support, and a ton of other little things that you may not notice, but are working behind the scenes to make your Arch Linux experience as smooth as possible. We've provided two ISO images with this release: the full-size image contains all official packages and the base-only image contains only base packages needed to get your system up and running." Read the complete announcement. Download: arch-0.5-base.iso (104MB), arch-0.5.iso (627MB). The 4th beta of Arch Linux 0.5, code name "Nova" is out: "We've been working hard at preparing Nova over the last few weeks and now it's almost ready. Arch Linux 0.5beta4 is available on the mirrors now, which has all the functionality of the final release but without updated documentation. If you do not require concise, up-to-date installation help, then feel free to grab the beta4 iso and give it a whirl. If you'd like to save some download time, you can get the beta4-base iso which contains only base packages. The base ISO is suitable for most broadband users who can easily download other packages with our package manager, pacman. Remember, this one is beta. If you find bugs, please enter them in the bugtracker." The release announcement. Download: arch-0.5beta4.iso (624MB) or arch-0.5beta4-base.iso (102MB). Arch Linux 0.4, code named "dragon", has been released: "We are pleased to present Arch 0.4 to the public for general consumption. This release comes with KDE 3.1rc5 and GNOME 2.0.2 as well as the latest versions of all our usual packages. Dragon still provides a streamlined package set (323 packages) but if you want more you can always access our unofficial package repository, which has about 350 more packages and is growing fast. Happy holidays!" The announcement, changelog, package list, documentation and download: arch-0.4.iso (543MB). "At long last, Arch Linux 0.3 is released! Firefly sports the new pacman 2.0, many new/updated packages and a (hopefully) smoother installation process. There is also some user documentation available which will get you started with the nuances of pacman and makepkg. All packages now have meta-info and dependencies, and the improved ABS system will allow you to follow different package trees. See the changelog for a list of new packages." Download it from one of the mirrors or try this link: arch-0.3.iso (543MB). Useful links: Arch Linux home page, documentation, changelog and mailing list archives. Arch Linux is an i686-optimised distribution for more advanced Linux users. Arch Linux 0.2 released: "The 0.2 iso is up on the mirrors and ready for download. I've named it Vega, after the 5th brightest star in the sky. Here's a summary of additions/improvements: interactive installer cabable of cd- or ftp-based installs, pacsync utility for upgrading your system automatically, more packages, latest versions of all packages, stock kernel package, improved package manager, root/boot disk images for install and rescue, many small bugfixes." Arch Linux is a new light-weight, i686-optimised Linux distibution. Visit the distribution's home page, view the installation instructions, FAQs and download the ISO from mirrors: arch-0.2.iso (281MB).